End of The Point Main House -- Is where the hustle and bustle of life stops and the relaxation begins. Our Main House is now available to rent for your quick weekend getaways, week holidays, or those family vacations. The Main House has a wonderful open concept, exceptionally remodeled to exquisite standards, and professionally decorated to feel like you just stepped into a coastal living featured home. Yet, a place to put your feet up and truly relax. As you walk in the front door, take in the breath taking and expansive water views. You will easily get swept away by the scenery alone. The living room is warm and inviting, surrounded by floor to ceiling windows with two sets of sliding doors to take advantage of the large outdoor space overlooking the water. Wake up with the sun light filtering through the many windows. Walk out on a private patio over looking the expansive view with a hot cup of coffee and just relax-- It is truly breath taking. At night snuggle up on the patio, have a BBQ, and listen to the tide come in or relax by the indoor gas fireplace on those chilly NW nights. The homes features a large kitchen with many windows to once again take in the amazing water view, granite counter tops, SS appliances--perfect for large party gatherings. Downstairs is a large walk out basement to the back grassy lawn. It has an amazing second bath with custom shower, bar area and extra sleeping space(s), and a craft room. 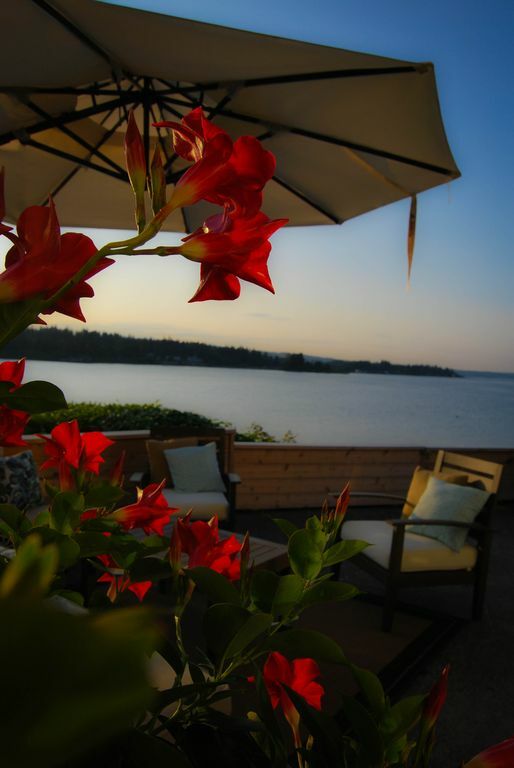 Choose just to relax at the house, take a quick ferry to downtown Seattle, or explore many outdoor adventures the area has to offer--this property is located in a prime location. ****Inquire within to find out how to rent the entire property. Keywords: Beautiful breathtaking home with an expansive view of the water..... We welcome you to End of the Point--'Main House'. We are a family of 4 who work hard and are dedicated to loving our boys. Our home is something that we take exceptional care of and if we are not working to make it just right for our visitors, we are working on our main residence to make it just right for us. We love to be on the water, travel, and be together. The Kitsap area is a beautiful region that is close to so much but still remote enough to feel that peace and relaxation we forget to take time for. This home is truly unique, one of a kind, and an amazing NW experience. Quiet relaxation in a beach atmosphere. This homes sits steps away from the water. It is truly a rare home that even people in the NW have never experienced. We love 'End of the Point' and are excited to share it with you. I'd give more stars if I could! Beautiful spot and so clean and comfortable. Very peaceful and the house and views were amazing. Would definitely use again. Comfortable, clean and beautiful home. Extremely comfortable beds with upscale linens. All pots, pans, etc needed for home cooking. Easy access to water. Gorgeous views. We loved the gas fireplace. Super quiet neighborhood. Location, location, location. That was the best part of the stay. The view when you first walk in is captivating. You also get a great view from the two upstairs bedrooms. We had fun watching the tide come in and out. I learned about clams that "spit"! The house was clean and had just a couple of problems that the owner fixed for us. Having three bedrooms worked, giving each of us our own room. You could sleep a whole lot more as the basement is quite large. We truly enjoyed our stay at End of the Point! The home was everything depicted in the photos. We would definitely recommend this property and we would not hesitate to stay another time in the future. The property has a maximum occupancy of 6 people, unless authorized in writing by the owner. Any extra person that was not authorized by the owner will be an additional fee of $50 per person per night charged to guest who made the reservation. Rates are subject to change at anytime until reservation is confirmed.